Now let’s talk about Angular Components. Firstly in Angular everything starts with a “Controller”. It’s the essential player in Angular framework. Controller contains both “logic & state”. Next there comes “Views”. Views are made of “bindings & directives”. This is how Angular talks to & listens to the user. Controllers can communicate with Views in two-way or one-way bindings. Lastly “Services”. This is the core component of Angular. It actually contains the real logic of your application. If you think of your application you might think where you should put the real logic of application. This is the part where you want to put the logic. Now as you can see we’ve learned so much isn’t it. Nope actually not. There is more coming. It’s time for us to building a simple “hello world” program with Angular. Yeah it’s the time for coding. I think now you’re ready to learn something isn’t it. So here is it. 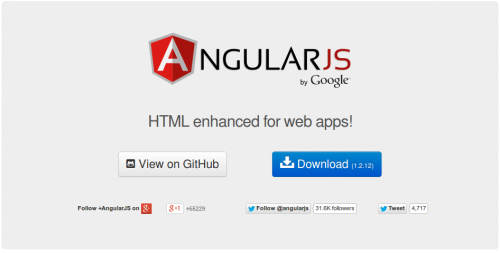 Before starting coding I want you to go to Angular JS site & download Angular minified version. Now create a directory in your localhost by any name & then put the angular.min.js file in there. Then open up any of your favorite IDE/Text Editor you like. Open up the directory & in that directory create a file named index.html & then put the code below. Now that’s not a messy code isn’t it? Is it hard to understand the coding? Please follow the article I’m sure you’ll know about something interesting. In the above code snippet you can see that in the <html> tag I’ve putted “ng-app”. ng for Angular actually. Now what is ng-app? Angular actually listens to this special attributes. We’re gonna learn about these attributes in time but for now you can know that for letting Angular handling your application you need to put this attribute into your html tag. I’ve putted it in my <html> tag & it’s not defined that you must have to put that only in your <html> tag. You can also put this attribute wherever you need to give Angular permission to handle your data. Hope you did enjoy the post & learned things about Angular JS. Stay tuned for more post coming soon. Don’t forget to comment as your comments are precious to me.